Summer Camps Ireland,STARCAMP Summer Camps 2018! WHAT TO EXPECT AT IRELAND’S NO 1 CAMP IN 2019! Whether you are a boy, girl, sporty, shy, creative, eager, nervous, energetic, musical, fun loving, serious, self-assured or reserved – this is the camp experience that your child will love and will remember for a lifetime! This years theme; COMEDY! Because we all need a good laugh…. Our Eagerly awaited 2019 Movie and acting scenes include… Mary Poppins, Toy Story, The Lion King… and some Gangsta Granny for our David Walliams fans! CAMP TIMES; 9:30am – 2:30pm for 5 days. Registration will take place on the first morning of camp and once all children are checked in, they will then be sub divided into their own age groups and a daily roll call will be taken. After the first morning – you will know where to drop and collect your child for the remainder of the camp. MOBILE PHONES are not prohibited at camp. They can remain powered off in their bags if required for outside camp hours. OUTDOORS – When and where possible and safe, children will play outdoors for part of the day. If this is the case at your chosen camp venue and the weather is fine -please ensure that your child wears sunscreen and brings a sun hat. INSTALMENT OPTIONS AVAILABLE; Starcamp places are limited and every year so many of you are disappointed to learn that your preferred camp is fully booked. Either book online now or call 021-4377900 to secure your place today for just €20 using our instalment option. Thank you for considering sending your child to STARCAMP Summer Camps. 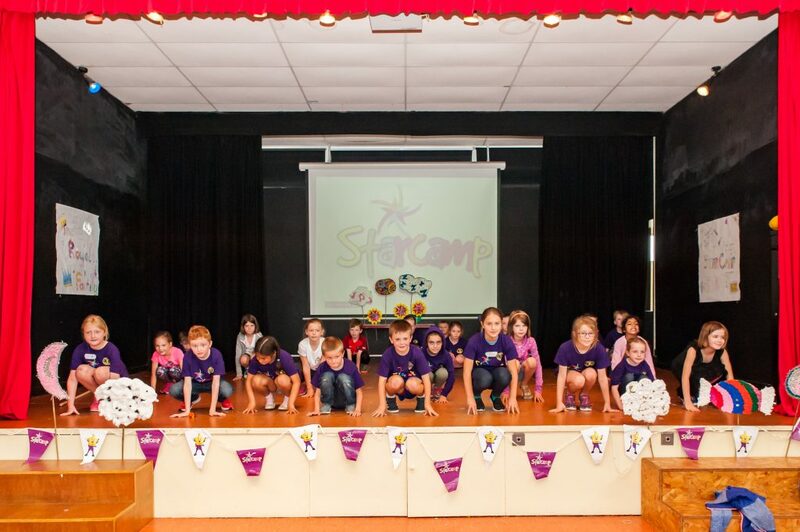 Over the past 11 years, teams from STARCAMP HQ including professional performers, teachers, parents, psychologists and some children have been involved in creating the ideal camp to give your child a week of fun, games, performance and creative arts. While they are laughing and smiling throughout the week, our staff have been trained to encourage, motivate and mentally psyche them up for the wonderful human being that they are. This is what sets us apart from the rest! Our focus is on the children each day. And while they put on a little showcase on the Friday, this is not what the camp is based around. This is merely to give them the opportunity to perform in front of you and shine! We are incredibly aware of nerves, shyness, various levels of ability aswell as the born showmen and women who attend – and ALL are equally important to us. Everything that we offer at STARCAMP, is hugely beneficial for a child’s well-being. Music – which is proven to ignite developmental and intellectual skills in children, Dance – great for balance, co-ordination aswell as physical strength and flexibility and Drama – where children enter a world of the imagination and where confidence can easily be worked on. These combined with our unique games, art and other offerings make it an easy choice to give your child the gift of STARCAMP.